Ari Beser is a Getty Images Contributing Photographer, Fulbright National Geographic Digital Storytelling Fellow, and Author of The Nuclear Family, a book about his familial connection to both sides of the atomic bombings of Hiroshima and Nagasaki. He has contributed photography to ICAN since 2013. 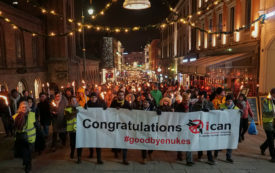 ICAN’s visionary work has brought us that much closer to a nuclear-free world—and won them a Nobel Peace Prize in the process.